Complete with modern styling, a dropped-back design and hip-length hem to completely eliminate drafts, the Ice Rider IRX Extreme Jacket was built for ice or trail riding and all-out fun in the snow. With a hip-length hem and dropped-back design to keep you warm, the jacket also features fleece-lined pockets for cold hands, 3M Scotchlite reflective piping for visibility and a blend of Cordura and ballistic nylon construction for durability. Full cut arms offer great mobility and the pit zips prevent you from overheating. Also features an MP3 player-compatible zippered inside pocket. Ice Rider™ snowmobile suits are stylish, warm, built for total mobility and designed with rugged and durable materials so your suit will last the most demanding rides. 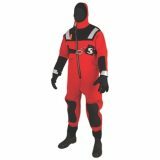 In the event of an ice-breakthrough or cold water immersion, they are designed to keep you afloat and reduce the risks of hypothermia. Trust the Triple Layer System in Mustang Survival's Ice Rider™ products to keep you protected throughout your ride. Two sets of heavy-duty 2" webbing handles provide handholds for two people. Two 1.5" stainless-steel D-rings on the nose allow for towing, lining and lowering.